In large bowl place flour, salt, sugar, garlic powder and yeast. Mix with large cooking spoon for about 15 seconds. Add in olive oil and water. Mix for about 30 seconds or so. Remove from bowl, place on lightly floured surface. Knead for about 5-8 minutes (add flour if sticky or water if too dry, but very small amounts at a time). Form into a ball, place back in a bowl and cover with plastic wrap. Let rise in warm place for about an hour or until dough is doubled in size. Preheat oven to the highest temperature for about 15 minutes. Split dough in half if making small pizza, or if large than use all of it. Roll out into a round or whatever shape you prefer. Sprinkle some flour or spray some butter on pizza pan or baking sheet to prevent dough from sticking. Place rolled out dough on pizza pan or baking sheet. 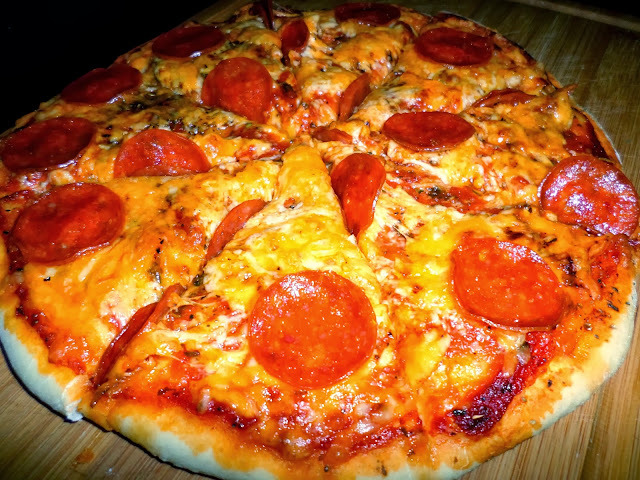 Spread pizza sauce, sprinkle salt, pepper and herbs, sprinkle cheese, top with pepperoni. Place in oven, bake until golden brown. That's what happened to that other half of dough.